After years of making my best friend Dorothy’s chocolate torte I decided to put my spin on it for a fun Christmas dessert. My husband loves Rumplemintz and I love peppermint chocolate- when these two ingredients collide… WOW! A fun & minty dessert that is so easy to make with a great holiday presentation! Divide cooled cake into 3 sections. 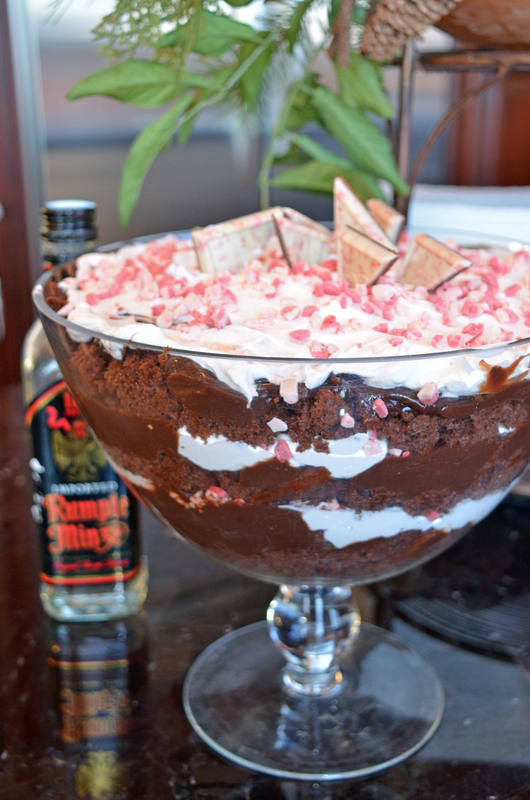 Start by Crumbling 1/3 of the cake and put in the bottom of the bowl; sprinkle the cake with the Rumplemintz…. Spread 1/3 of the prepared pudding on top of crumbled cake. It’s important to be mindful of the edges of the bowl- you want this to look pretty!! Next, spread 1/3 of the thawed cool whip over pudding. Sprinkle 1/3 of the Andes crunch baking chips on top. Repeat this whole process 2 more times. Finish by carefully cutting the Ghirardelli squares in half and poking them in on top. Insert large spoon and watch it disappear!!! *Try using peppermint coffee syrup in place of the Rumplemintz for a non-alcoholic dessert.